NOVOVOLYNSK, Ukraine -- In Ukraine's west, long a bastion of pro-European sentiment, the war and economic crisis are shaking faith in the country's leadership. Ian Bateson reports from Novovolynsk. In the Buzhanska mine 12 kilometers (7 miles) from the Polish border Ukrainian miners are putting on their uniforms and collecting their flashlights as they prepare to relieve the nightshift. The work is grueling and little of it automated. In the past mining was one of the better jobs in the area, with miners able to earn up to $240 (219 euros) a month. With miners owed months in back pay by the state that is no longer case. The average wage in nearby Novovolynsk, a city of 57,000 built in 1950 to support the then new mines, is $140 a month. Though locals say the most people not working in the mines can hope to make is $119. Here the economic crisis that followed the Maidan protests and the war - which destroyed 60 percent of the local currency's value - has hit hard. "What did we need all of that for? We've gotten nothing for it," says Svetlana Shevchuk, 56, who is forced to live off of the state's unemployment payments, now worth $20 a month. With Novovolynsk so close to the Polish border locals have watched not only as the standard of living in Poland has risen since the fall of communism, but again as Ukraine has gone into economic crisis while Poland continues to be an engine of growth in the EU. Normally that proximity and financial disparity would provide lucrative opportunities for potential investors, but here the uncertainty concerning Ukraine's future takes its toll and keeps such people away. "It is hard for investors because of the instability. Russian could be here tomorrow," says Vasyl Mikas, head of the city's Communal Enterprise Department. The closeness of the border does create an opportunity for smuggling, providing a lifeline to those unable to find work or make ends meet. A Polish law allows Ukrainians living near the border to receive a special permit and travel back and forth instead of having to apply for a visa as Ukrainians usually do. Though trade once went both ways, the depreciation of the hyrvnia, the Ukrainian currency, means now it mainly focuses on taking alcohol and cigarettes bought in Ukraine or Belarus and selling them to Polish buyers who want to avoid import duties. Novvolynsk is in far western Ukraine, yet the effects of the war are palpable. 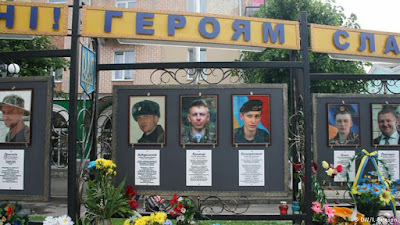 The main square displays the portraits of local men killed at the front and at two storefronts people collect supplies for soldiers. So far nine have been killed and three are missing in action. In total over 600 men from the district have been drafted and are fighting in the Ukrainian armed forces. Others are fighting in volunteer battalions with the right-wing Azov and DUK, which is associated with the far-right group Right Sector and said to be the most popular, though there are no official statistics. In a new youth center that offers art lessons, children's drawings are often of soldiers. "A lot of the children have fathers serving at the front and they talk to them on the phone," says Pavlo Medina, the center's manager. Many of the city's founders came from Donbas to operate the city's mines in the 1950s. Those family connections have also brought many IDPs to the city according to Olena Martenyuk, the local supervisor of work and social programs. Three hundred and fifty-seven people are officially registered as IDPs in Novovolynsk. Their families are each entitled to maximum support from the state of $114 a month calculated based on the number of family members. Even in Novovolysnk it is not enough to pay for rent and spiraling utilities, she says. Olha Kazymyrova, 39, arrived with her husband and young son from separatist-controlled Makyavka in August. After months of shelling she had trouble explaining to her four-year old that they no longer needed to go to the cellar to seek shelter since people here only used them to store potatoes. It has not been easy for her to find work or a place to live, and her husband, a miner - seeing as miners go unpaid in Novovolynsk - went to Poland to work 80 hours a week in a frozen produce factory. "I am willing to work and I don't have a problem working in the field," says the trained athlete and marathon runner. "The problem here is that absolutely nothing has changed since Maidan," says Borys Karpus, a city council member. According to him, though local residents supported the Maidan protests, they have not seen change coming from Kiev or locally. Hoping to fix that, he founded a local branch of the reform party Samopomich, or self-reliance, one of the governing parties in Kiev led by Lviv Mayor Andriy Sadovyi. With local elections across Ukraine scheduled for the end of October, Karpus is hoping to bring a mandate for change here. For now, working abroad as domestic help in Italy and or in other EU countries acts as a pressure release valve for the dismal economic situation. But for many that is not enough. Tetyana Dyachuk's husband runs a second-hand electronics business in Portugal, while she returned with her children to raise them here. "I don't understand what Poroshenko and Yatsenyuk are doing. It is war but it still can't be like this," she says. For the older generation it is hard to see so many of the young leave to find work or to fight. Vasyl Buslovsky, 89, is originally from Russia's Belgorod region and was sent to Novovolynsk to drill the first mines back in the '50s. He laments that the economic situation has made his grandchildren move away to the US and Norway and makes their children not even want to visit Ukraine. "Our leaders are all millionaires, he says. "And they don't want to listen."